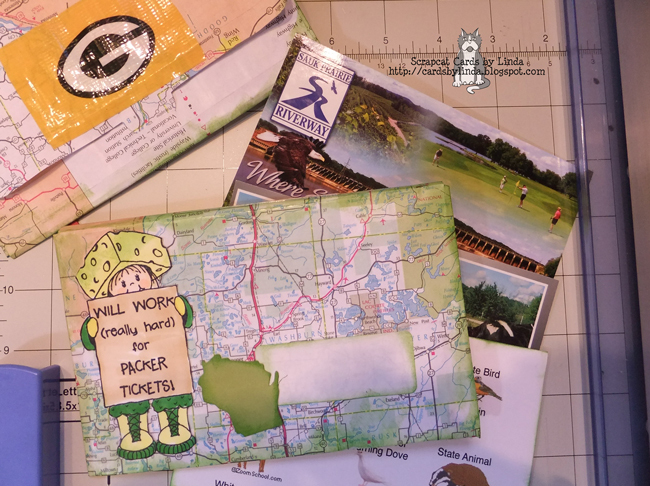 The theme for the Mail Art Swap at Your Paper Pantry this month is Art of the State. The goal was to tell something about your state. Well since it is fall and football season I just had to pull out my favorite Peachy Keen stamps and some old state maps to make my envelopes. Oh and a little duct tape for good measure. I added some post cards and one post card that I made. You have two more days to sign up for the swaps at YPP. It is a lot of fun. I hope to see you there. Too fun for sure...who wouldn't want a packer set,love it! Hope the kittens are doing well together. 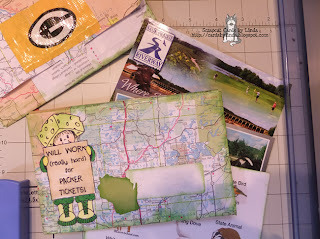 hi Linda- I totally love mail art and I try to make sure every envie I mail out here is decorated one way or the other! This is awesome- love your idea. I have been scoring thru books showing mail art lately!